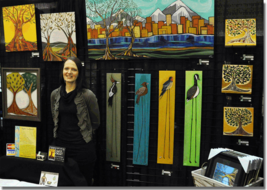 Craft Shows in Tennessee 2019–2020. Shop over 150 vendors, FREE inflatables for the kids, Fun Train Ride, FREE Live entertainment playing on stage all weekend, Food vendors, FREE admission & FREE parking, delicious food, and plenty of sweet tea & sunshine! Join us for the 78th Annual Middle TN Strawberry Festival in Portland, TN on May 11, 2019! This year's theme is "Berried Treasure." Enjoy free live music, over 125 food & craft vendors, bingo, inflatables & activities for kids, carnival, 5K walk/run and more including a meet & greet with "Captain Jack Sparrow." There will be a parade at 4pm followed by a free concert at 6:30pm featuring Lee Gibson with a fireworks display to end the night! FREE admission! Bring the entire family and enjoy delicious food, live entertainment, inflatables and petting zoo for the kids! Enjoy this family-friendly event with your whole family! Over 40 awards for top ranking autos in many categories. The Nashville National Art Festival premieres at the popular, upscale CoolSprings Galleria and features an unparalleled array of carefully vetted works from the nation's top artists and artisans. Handmade-in-the-USA pieces of jewelry, paintings, photographs, sculpture, pottery and more await you in the “Athens of the South.” The Nashville National Art Festival is conveniently located between Mallory Lane and I-65. Family festival for the entire family! Free admission, food vendors, over 150 vendors, kids activities, and much more! Proceeds benefiting Family Cornerstones of Cleveland. Shop over 100 vendors just in time for the Holiday season! Get your picture taken with Santa for free! Hours of event 11:00 am - 5:00 pm. Free admission! Free parking! We will also have a Christmas on Cambridge Square 5K Glow Run beginning at 8:00 pm! Ladies Shopping Festival!! Silent auction for beautiful 6 or 8 piece tablescapes and decorated Christmas trees and centerpieces. Crafts & vendors, lunch available and door prizes awarded throughout the day. $200 Grand Prize for one winner. Free admission and parking. Please come out to support Shriners Hospital for Children in Lexington, KY and get a jump on your holiday shopping!! The 4th annual Mistletoe Market Holiday Craft & Vendor Show is the largest craft show in Cleveland! Shop over 135 unique vendors to complete that Christmas list! Beat the Black Friday rush and purchase all of your holiday gifts and decor the weekend before Thanksgiving! Don't forget to register for the 50" flat screen TV giveaway in the cafeteria!